Fintan Vallely is a musician and writer on Traditional music. 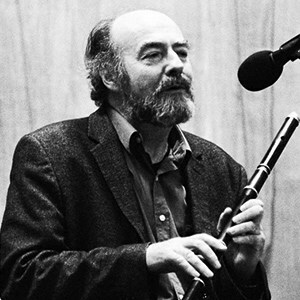 A performer since his younger teens in the early 1960s, he played in Ireland, Britain, Europe and the USA, and was the author of the first tutor for Irish flute in 1986. He teaches flute the at the Willie Clancy summer school in Co. Clare annually and at workshops internationally. He recorded an LP – Irish Traditional Music – in 1979, this and a 1990 album with guitarist Mark Simos, The Starry Lane to Monaghan, both on CD. He toured with singer and accordionist Tim Lyons, with whom he recorded an album of satirical song, Big Guns and Hairy Drums. Over the years 1995-2013 he performed A Fool’s Errand, a show with the late poet Dermot Healy in which he plays his own compositions; this has been broadcast on radio. A commentator on Traditional music, he has always been concerned with the scarcity of resource materials in that field and has written as a critic The Irish Times and the Sunday Tribune. He has lectured on it at the National University of Ireland, Maynooth, later at University of Ulster, Trinity College Dublin, Dundalk Institute of Technology, Queen’s University Belfast and in Britain and the USA. In 2011 he left full-time lecturing to concentrate on performance. Drawing together his performance and academic knowledge is his major published work is Companion to Irish Traditional Music (1999 and 2011), a major encyclopedia of Irish traditional music and related cultures. His other books have dealt with a variety of musicians including Antrim flute player John Kennedy and Leitrim fiddler Ben Lennon. The new edition of his flute tutor – A Complete Guide to Learning the Irish Flute – which incorporates a full range of techniques involved in traditional flute playing – was published by Walton’s Music, Ireland in November, 2013; this draws on his 2004 Doctoral research into the flute in Ireland; other research on the origins of the bodhrán in Ireland is pending. Over the years he has composed many songs and a large number of instrumental tunes which he is currently preparing for recording. In 2012 his academic and artistic knowledge were brought together in the presentation of Compánach, as a musical interpretation of his Companion for the major French summer school of Irish music at Tocane. This was developed as a full concert with music, song and dance, and performed at Centre Culturel Irlandais, Paris, and the Leuven Institute, Belgium, in late 2013. He has travelled widely playing music – in Ireland, Europe, Scandinavia, Canada, the USA and Australia, and presently tours in Compánach with Dundalk fiddler Gerry O’connor, Monaghan piper Tiarnán Ó Duinnchin, dancer Sibéal Davitt and singer and fiddler Roisín Chambers..